For a quick treat, stroll into the Windy Saddle where a delectable display awaits in their dessert case. Our favorite – Pumpkin Caramel Bread Puddin’. Another grab and go option is Gold Mine Cupcakes where you can find all kinds of delicious cupcakes, from Turtle Delight to Red Velvet. Stop by their Sprinkle Bar to add a little extra sweetness! How about setting up a dessert date with your sweetie? Peaches are in season and Abejas is serving a Palisade Peach Semi Freddo, a Sauternes soaked olive oil cake topped with cinnamon meringue. It’s almost too pretty to eat. Almost. Maybe you want to share a more traditional dessert? 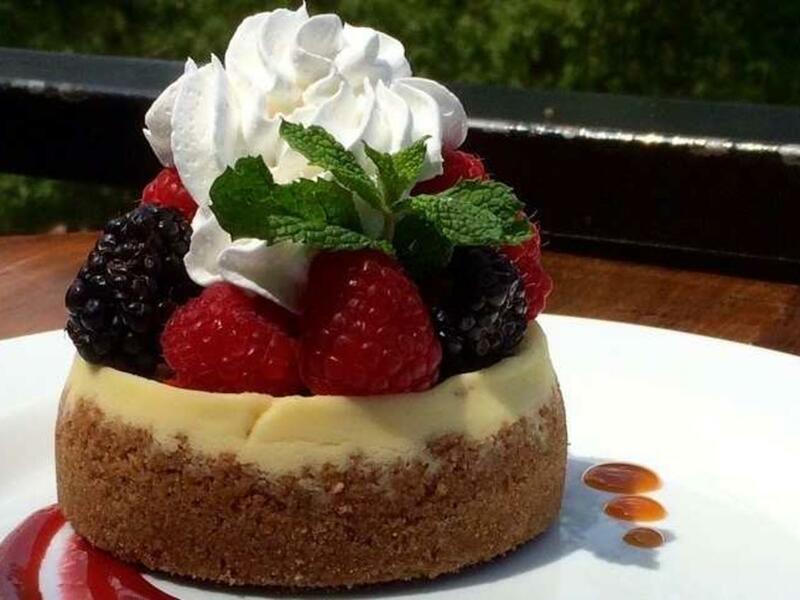 Bridgewater Grill at the Golden Hotel is serving a New York Cheesecake with a buttermilk graham cracker crust, topped with the season’s freshest berries served with sweet whip cream. Wow. If you want something lighter, Goozell Gourmet Yogurt offers premium frozen yogurt and a plethora of toppings all right in the heart of downtown. If a malt or milkshake is more to your liking, you’ll love the old fashioned soda fountain at Golden Sweets. Indulge in Golden and afterwards, a stroll along Clear Creek is like a cherry on top – the perfect finish.